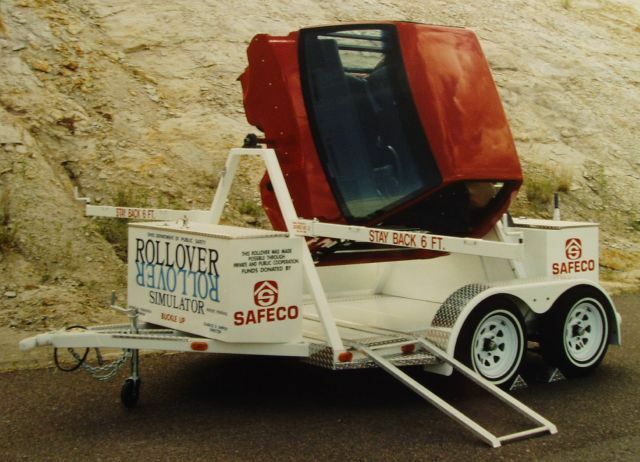 The Rollover Simulator was designed and fabricated by Frank as an aide in teaching people the necessity of using seatbelts to avoid serious injury in a car crash resulting in a rollover. The "dummies" in the simulator that are not restrained by a seatbelt are thrown from the simulator in a terrifying real enactment of the deadly results of seatbelt negligence. Increasing the number of children riding in the back seat. Compact pickup truck cab affixed to a two-axle low profile trailer. Acceleration and braking control systems spin the cab to simulate a rollover accident. Please email or call for a quote. Trailer is manufactured of 1 ½” x 3” rectangular tube with a 14-guage steel floor covered by Treadbrite aluminum deck plate lids and triple latch key locks. Weight (w/tools & generator)...................................... 2,040 lbs. Lights........................................................................ Rear tail and stop lights (inside protective steel housings), side markers, clearance lights and license plate bracket with light. Hook-up.................................................................... .Wiring for all necessary lights plus ground and brake wires through a standard 6-plug trailer connector. Storage Boxes are manufactured of 16-guage steel with Tradbrite aluminum deck plate lids and triple latch key locks. Disclaimer: Lakewood Manufacturing Co. assumes no responsibility for the injury or damage to people or property resulting from the operation or transport of the Rollover Simulator. Find out more about purchasing a Rollover Simulator or get a brochure.